The Allure Summer Beauty Box has sold out! I don't ever remember the Beauty Box selling out as quickly as this one. Within ten minutes they were all gone. I know I barely had time to get my order placed before the dreaded "sold out" image appeared. I'm not sure if this is true for all but according to others who commented on Allure's Facebook page if you used a web browser other than Firefox you may have experienced difficulties accessing the site. Personally, I was able to access it just fine but then again I was using Firefox as my web browser. For those that missed out or decided to skip the Summer Beauty Box, check back in August when Allure will be announcing the official release date for the Fall Beauty Box. Additionally, for those that experienced dead links, or unable to load page, or any other issue with the Beauty Box link that Allure posted on their Allure.com webpage then please use this link: AllureAccess.com. It is a direct link that allows you to purchase the Beauty Boxes or any other products, contests, etc. that are sponsored by Allure. GET READY! 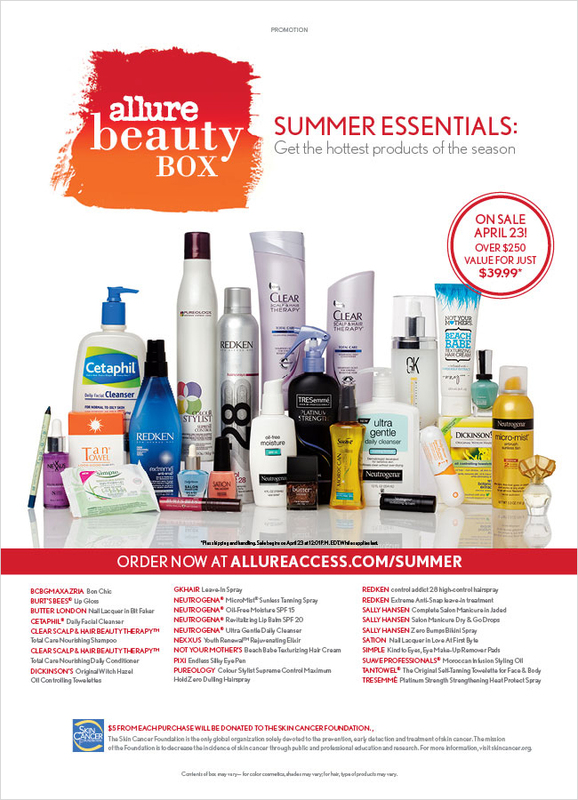 On April 23rd at 12:01PM EST the ALLURE SUMMER BEAUTY BOX will go on sale! You will receive over $250 worth of "SUMMER ESSENTIAL" beauty products for the low cost of only $39.99 with an additional $10 for shipping and handling. So in all the cost is $49.99 plus tax and typically $5 of the purchase goes towards a charity of their choosing. I've purchased the beauty boxes in the past (check out the 2012 Fall box here and here) and I am always surprised by all the great products included in them. There is always something for everyone in them and there is plenty to share with others too. If you want to be alerted for when they go on sale again you can sign up to be a beauty enthusiast here. Or you can join here as well There is not cost to be a member and there are a lot of great opportunities to receive free samples or deals on many new and old beauty products. I'll be sure to update this post with the link for the 2013 Allure Summer Beauty Box once it has become active. The link for the beauty boxes will be active until all quantities have been sold. So when the sale first starts you may experience some slow down with the web page but it quickly passes. However, if the link quits working or fails to load then you know the beauty boxes are all sold out. In the past it has taken 24-48 hours less than 10 minutes this time.